Unsolicited tests continue to backup Battery Equaliser’s claims. The following report of a test of the product “BATTERY EQUALISER MAINTENANCE & RESTORATIVE FLUID” supplied by Enviro One Inc. to The Battery Place, 1610 Cranbrook St. Nth., Cranbrook, B.C. V13S8 in December 2002. The test was initiated and conducted by The Battery Place in Cranbrook, B.C. without any outside influence or direction except that on the product label. In November 2002 an advertisement in the Service Station & Garage Maintenance magazine attracted attention when another “battery additive” made great claims in “revitalising” old batteries and extending the life of new batteries. It was decided to test the claims. While a long term test (years) was not practical for a quick evaluation of the “Battery Equaliser Maintenance & Restorative Fluid”, a good short term test would be easy. 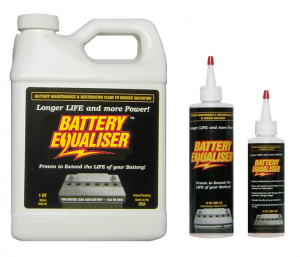 The recommended quantity of “Battery Equaliser” (56ml. per cell) was added to each cell and the battery was discharged overnight using three automotive headlights. In the morning, as expected, the lights were completely extinguished and none of the cells registered on the hydrometer. The battery was recharged with a 20 amp. Automatic charger and eventually the hydrometer reading in each cell reached a surprising 1.260. The battery was discharged again, but this time the lamps were still glowing dimly in the morning. Again the battery was recharged and this time the hydrometer readings reached 1.275 in each cell. For the third time this eight year old battery was discharged and in the morning the lights were still bright. The battery was recharged yet again and this time the hydrometer reached 1.280 in all cells. After sitting idle for fifteen days hydrometer readings were taken again and all cells maintained the readings of 1.280. This eight year old battery is in “as new” condition chemically and has certainly proved the ability of “Battery Equaliser” to desulphate these battery cells. Obviously, if an eight year old battery can be restored it is reasonable to assume that the same “Battery Equaliser” in a longer term test will prevent sulphation in new batteries. This could neutralise the number one lead acid battery killer in the industry. When all is said and done this test battery is still eight years old but it may last a few more years yet. It will be fitted into a golf car and monitored. Shelley, I hope this helps, please let me know.